Aldersbach Brewery was first mentioned in a ruling of Count Albert von Hals to the monastery’s monks in 1268. Then, it still used to be a small brewery that mainly produced beer for private use. In 1803 Aldersbach was affected by secularisation. Both brewery and monastery were sold. In 1811 the family of the Baron von Aretin bought the two buildings. The brewery was restored around 1900. The first wheat beer was first brewed in 1928. Management, administration and shop is still in 2016 run by the von Aretin family. Nowadays, the brewery presents a total of 13 different beers in its product line. By constantly enhancing its products and modernizing the brewery, for instance, the new brewhouse and bottling filling line make Aldersbach Brewery a successful and modern medium-sized enterprise. 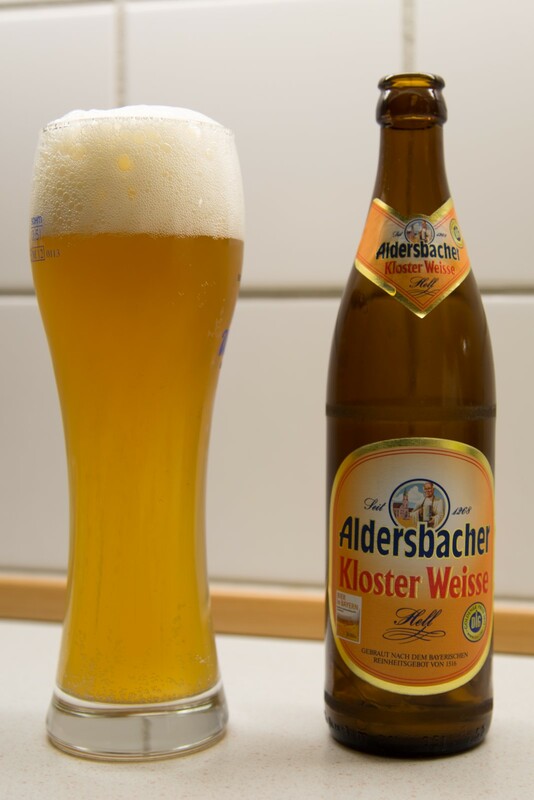 I bought this unfiltered weissbeer from a German webshop at the price of 1,49 Euro for a 500 ml bottle at 5,5%. Beautiful light yellow and only slightly hazy unfiltered beer. Large and rough head, a thin and fine top stays on. Good sweet aroma with a fresh play of wheat. Good CO2, powerful fruit that is just splendid and sweet. Long after taste.